Okay, so it's not Winter yet, but it sure feels like it! 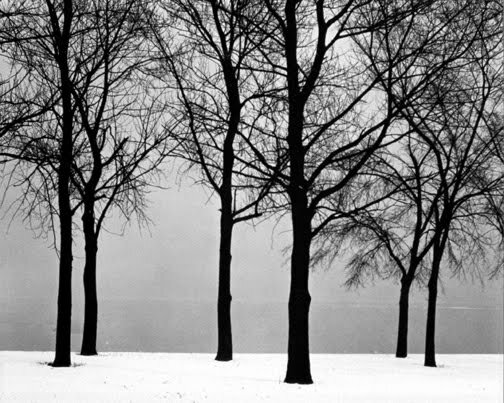 I love bare trees and whenever I see them, I think of Harry Callahan's Chicago Lake Front photograph. This was a fun project that I also did last year with LE. You can learn the technique from Crayola's website here. Students painted a gray background first and left the bottom of the paper unpainted for the snow. Then they took black tempera paint and blew it into multiple branches through a straw. They were required to place trees in the foreground, middle ground and background. 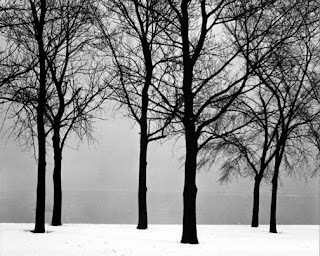 I love the look of winter trees, too, and all kinds of snowscapes. These look great.